Pelonis Technologies manufactures and tests all of our products based on the highest standards of quality and reliability. We have an ISO-certified facility that employs flexible manufacturing techniques. This is one of the reasons that a mobile satellite communications company approached us to manufacture a DC Blower for one of their applications. We were asked to design and build a blower that could adequately cool various system components. The blower had to stand up against moisture and dust in outdoor weather conditions on board a mobile vehicle. The customer had specifications that an environmental coating be applied to the blower’s circuit board to protect it from dust and moisture. In addition, a custom cable plug-in type connector and a special inlet guard also had to be coated for protection from the elements. Our solution was to fabricate a high speed 24 volt DC blower with an aluminum enclosure that was coated with this special coating. Initially, the blower was provided without a protective inlet guard, but after testing by our engineers and the customer, we worked together to modify the design to add the guard where needed. Additional Facts As specified by the customer, we modified the frame of the blower with a built-in protective inlet guard. 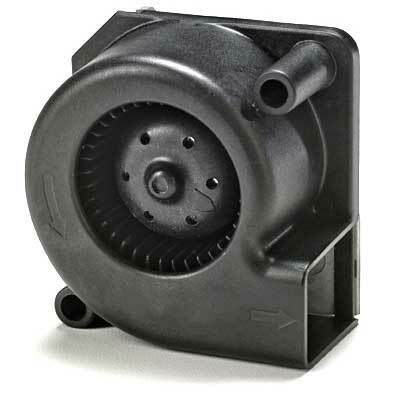 The blower was compact and rugged enough for the customer’s applications and met their requirements. We provided the required customization of the protective inlet guard for use in rugged environments and to withstand dust and moisture. The customer was pleased with our quick turnaround and innovative solution for making the protective inlet guard.